« #SpringFling at Mosaic Grille & Bar – It’s an Eye Candy too! 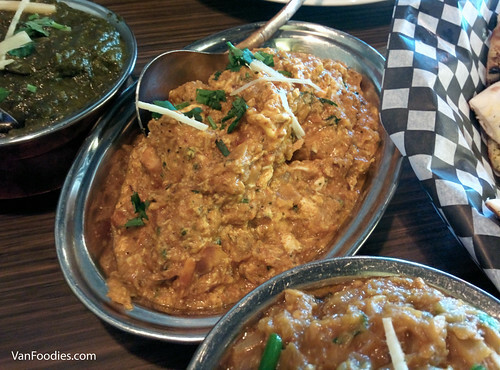 Last fall, I was invited to a fun dinner at Tasty Indian Bistro where I was picked up in downtown Vancouver by the Vancouver Trolley Company then taken to the North Delta restaurant. While the food was great, it’s always hard to evaluate a restaurant based on the food they serve at an event. 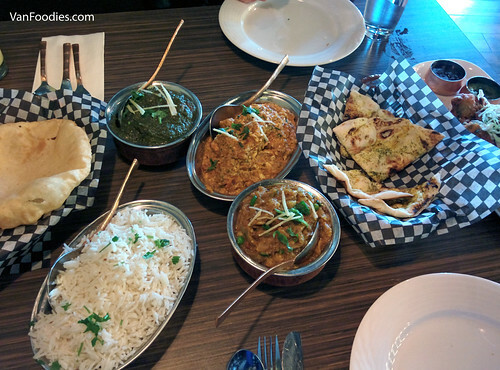 So when we were looking for an Indian restaurant for lunch the other day, we went back to Tasty to give it another try. The Vegetable Pakora was very good. It was crispy outside, but light and pillowy inside. You could see and taste the pieces of vegetables in the batter. 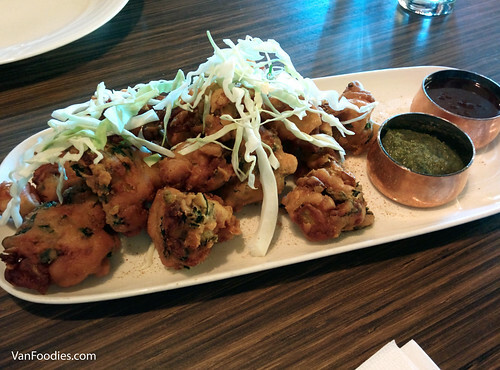 The tamarind sauce brought some sweetness to it, while the mint sauce added freshness to the fried dough. We like the size of the pakora, taking only two bites each. I’m a fan of Saag dishes (in a spiced spinach cream sauce). Instead of paneer, this time we ordered Lamb Saag. The meat was tender, still with a bit of gamey taste, and it was really good. 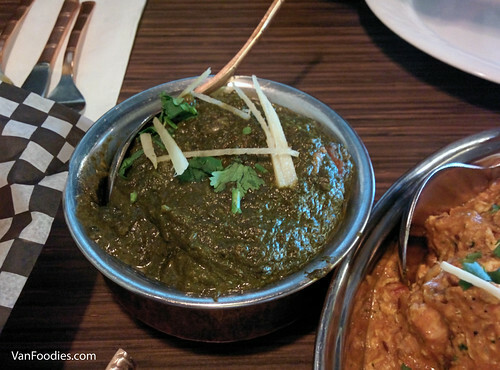 The saag was creamy, had a good mix of spices, and decent heat level. I wish there were more lamb pieces, though; there seemed to be plenty of sauce with just a few pieces of meat to share. Chicken Muglai was something new that I’ve never had before. It’s in a tomato-based sauce but with eggs scrambled in it. It may not look the most appetizing, but it was a very good dish. The egg added richness to the dish, which helped balance the otherwise dry pieces of chicken breast meat. Mr. thought this was the spiciest of the mains we’ve had, but I respectfully disagreed. 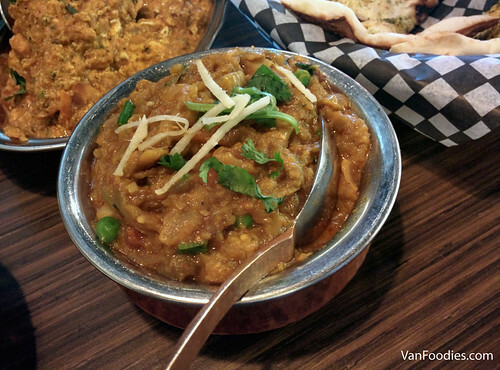 Our vegetarian option, the Baingan Bartha, was what I thought the spiciest of all. Really enjoyed the mashed eggplant, and the cumin flavour was very prominent. It paired well with rice (vs. naan bread). I also liked that there’s not much filler in this dish. For sides, we opted for the Garlic Naan. 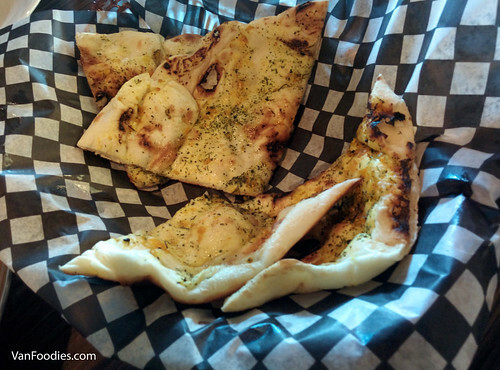 It was a bit greasy, but the garlic taste was definitely there, and it was much more interesting to eat than regular naan bread. 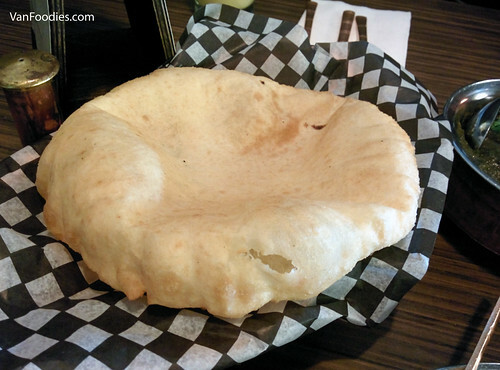 We also had the Bhatura, the deep fried naan bread. As it arrived at our table, it was super puffy! It’s deflated a bit when I took the picture below. I thought it would be greasy/oily, but it was really good. It had a crispy exterior and because it was puffed up, it had this air pocket that allowed you to fill it with sauces and meat. It’s good on its own, and even better when paired with food. It was a Saturday afternoon, and it looked like they were understaffed. We waited for a bit at the door, with no staff in sight, before someone finally acknowledged our presence and took us to our table. After that, it wasn’t so bad. The food arrived rather quickly, and the server kept returning to refill our water. Looking around, the restaurant was quite packed at lunch hours, so hopefully they will continue to improve on staffing levels. All in all it was a satisfying lunch. I thought the food was quite good, with the spice level that allowed me to enjoy the food without burning my tongue. It’s not very cheap, though, with our food bill coming to around $50, but the interior decor and overall atmosphere is more upscale than other Indian restaurants in the area. And yes, there are many options so I can only imagine how competitive it is for them.